There have been many great books written throughout the centuries. Some of them begin with paragraphs that have become immortalized, as with Charles Dickens opening to "The Tale of Two Cities". It is a lyrical portrait of the age in which it was written. And, of course, it is still applicable today. I have always been highly cognizant of the first page of whatever I am planning to read. It sets the tone for the rest of the book. And sometimes, as with Dickens, the opening paragraph speaks to an enduring human condition. I'm kind of taking a day off, but wanted to share with you one of the best opening paragraphs to a mystery that I have ever read. 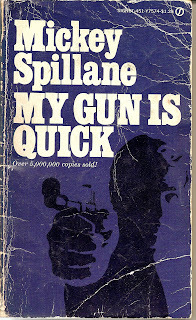 It is the opening page to Mickey Spillane's 2nd book, the 1950 bestseller "My Gun Is Quick." 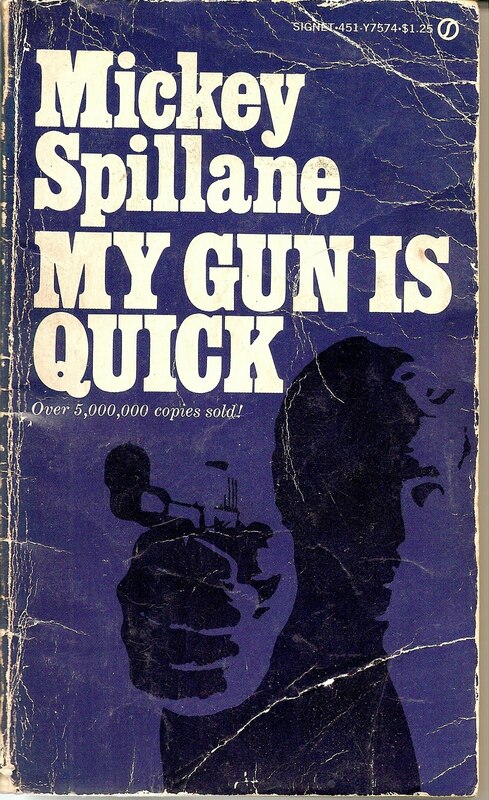 This is the book that got me yelled at in 4th grade. And here I am, 46 years later, still in awe of this runaway paragraph. With it's inattention to punctuation notwithstanding, it is still, to me, one of the most powerful openings of any mystery that I have ever read. And the rest of the book isn't bad either! "When you sit at home comfortably folded up in a chair beside a fire, have you ever thought what goes on outside there? Probably not. You pick up a book and read about things and stuff, getting a vicarious kick from people and events that never happened. You're doing it now, getting ready to fill in a normal life with the details of someone else's experiences. Fun, isn't it? You read about life on the outside thinking about how maybe you'd like it to happen to you, or at least how you'd like to watch it. Even the old Romans did it, spiced their life with action when they sat in the Coliseum and watched wild animals rip a bunch of humans apart, reveling in the sight of blood and terror. They screamed for joy and slapped each other on the back when murderous claws tore into the live flesh of slaves and cheered when the kill was made. Oh, it's great to watch, all right. Life through a keyhole. But day after day goes by and nothing like that ever happens to you so you think that it's all in books and not in reality at all and that's that. Still good reading, though. Tomorrow night you'll find another book, forgetting what was in the last and live some more in your imagination. But remember this: there are things happening out there. They go on every day and night making Roman holidays look like school picnics. They go on right under your very nose and you never know about them. Oh yes, you can find them all right. All you have to do is look for them. But I wouldn't if I were you because you won't like what you'll find. Then again, I'm not you and looking for those things is my job. They aren't nice things to see because they show people up for what they are. There isn't a coliseum any more, but the city is a bigger bowl, and it seats more people. The razor-sharp claws aren't those of wild animals but man's can be just as sharp and twice as vicious. You have to be quick, and you have to be able, or you become one of the devoured, and if you can kill first, no matter how and no matter who, you can live and return to the comfortable chair and the comfortable fire. But you have to be quick. And able. Or you'll be dead."